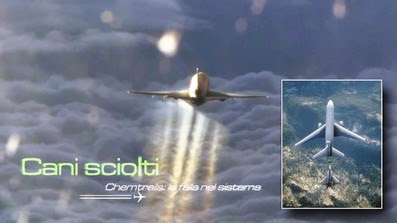 The New Jerusalem Chronicle: The Scoop On "Chemtrails"
The German science magazine "Raum+Zeit" published a lengthy article from Swiss researcher, Gabriel Stetter, entitled White Skies--The Global Warming Problem and Chemtrails. There are a number of sources out there (including the above) which are conceding the reality of chemtrails but at the same time theorizing regarding their role in (supposedly) fighting "global warming". You can use the search engines of my two websites to find out what my personal views are on "politically correct" environmentalism with its global warming doctrines. In passing, I would argue the fact that rotten-to-the-core characters such as Maurice Strong, Al Gore and Mikhail Gorbachev are global warming's biggest proponents...is by itself a pretty good leading indicator as to what a false alarm is this "global warming" business. 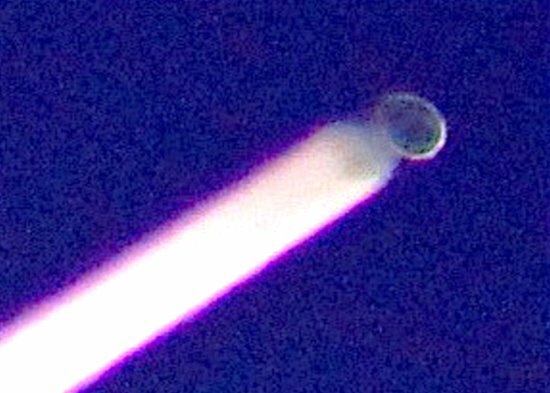 Dennis Kucinich, Democratic presidential candidate and Congressional Representative for the State of Ohio, tabled two motions (‘Space Preservation Acts’) to Congress, in 2001 and again in 2002. These motions call for a comprehensive ban on space-based weapons systems, and Kucinich specifically listed chemtrails in this category. 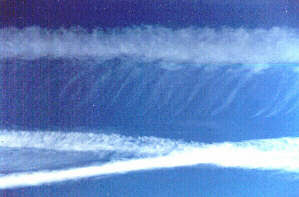 According to a number of sources, including government whistleblower A.C. Griffith...these chemtrails consist of a mixture of microscopic bits of barium metal and aluminum. Hence, the rationalization and "spin" that this is all about fighting "global warming". The metallic bits are supposedly reflecting the sun's rays away from earth. I'm just a layman but...it seems to me, once these nano-sized particles float to earth, how could they any longer block the sun's rays? No, the real story according to Griffith (and some others) is that this technology has been and IS being used (in current war theatres) for something called "battlefield imaging". By means of advanced technologies which are kept from the public, they can use these metallic flakes to create ground level, three-dimensional radar imagery. It's the perfect solution for Orwellian, Antichrist totalitarians: Potentially, upon completion of their nationwide "crop-dusting" of America with barium and aluminum nano-particles...they can then pull up three-dimensional imagery of anyone, anywhere, and at anytime. These criminal pyschopaths are now implememting military, "battlefield" technology on the American people...mere civilians. Though I see his views on geopolitics as rather flawed (he has a kind of FoxNews-ian "America and Israel against the world" outlook)...he seems definitely to have obtained an inside look at the whole "chemtrail" business. The precise wording for this enhanced radar technology is Variable Terrain Radio Parabolic Equation. You can readily find information about this stuff if you're willing to wade through pointy-head, academic websites. As usual, the globalists "secrets" are hiding more or less in plain sight. Only a few days ago, dramatic video footage has been published on Youtube (see screen capture above) in which a commercial airliner is being filmed from behind, in close proximity...and quite clearly we see stuff spraying out of the airliner. Clearly, we can see the spray turning off and on. Someone, somewhere (most likely at a military installation) is flipping a switch. Here is that Youtube video (2:48). Notice at 46 seconds, how the chemtrails turn off instantly...like a water faucet. And notice at the 1:46 mark...how this spraying comes back on, again like a water faucet. This video has caused something of a sensation around the Internet "underground" and is spilling into the mainstream as well. It is interesting how the mainstream media is now finally, in recent months stepping into make oblique references to the subject of chemtrails. With the controversy having now grown to a point where it might burst out into the mainstream of Internet discussion boards and talk radio...CNN.com has come out (as of May, 2010) with a limited hangout: The first mentions in the mainstream media regarding (what they are calling) "smart dust". WHO IS 'IN THE KNOW' ABOUT THIS MASSIVE OPERATION? Depending on the specific situation, they accomplish this secrecy and/or "containment" though a combination of psychological pressures, brainwashing, threats, blackmail, flat-out concealment...and also military-style "compartmentalization. It is conceivable that airport workers are told to load certain things onto these aircraft...are not told what it is that they are loading...and are advised to keep their mouths shut upon penalty of losing their jobs and retirement benefits. It's not that difficult, in the final analysis. After all, how many Area 51 employees have come out with "tell all" testimonies about Area 51? Answer: Maybe a couple, that I know of--A certain Bob Lazar and David Adair...both of whom have been relegated to utter obscurity by the media overlords. Again, criminals within our government have routinely been able to keep huge secrets concealed for decades on end...and they will continue to accomplish this. Excerpt from Did An Airline Mechanic Stumble Upon The Truth? :When I got into the bay I realized that something was not right. There were more tanks, pumps, and pipes then should have been there. At first I assumed that the waste disposal system had been changed. It had been about 10 years since I had worked on this particular model of aircraft. Excerpt from An Airline Manager's Statement:"Airline companies in America have been participating in something called Project Cloverleaf for a few years now. The earliest date anyone remembers being briefed on it is 1998. I was briefed on it in 1999." "They told us that the government was going to pay our airline, along with others, to release special chemicals from commercial aircraft. When asked what the chemicals were and why we were going to spray them, they told us that information was given on a need-to-know basis and we weren't cleared for it." "When we asked them why didn't they just rig military aircraft to spray these chemicals, they stated that there weren't enough military aircraft available to release chemicals on such a large basis as needs to be done. 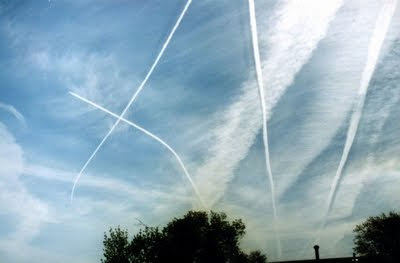 That's why Project Cloverleaf was initiated, to allow commercial airlines to assist in releasing these chemicals into the atmosphere." "Someone asked one of the G-men then if the chemicals are harmless, why not tell the public what the chemicals are and why we are spraying them? He seemed perturbed at this question and told us in a tone of authority that the public doesn't need to know what's going on...."
DOWN THE RABBIT HOLE: AEROSOL-SPEWING DISCS?! And then there are the netherworld aspects to this "chemtrails" thing...which even many hardened chemtrail watchers shy away from. For example, what in the world is this (in the photos below)? I would suggest reading through the second half of my Chapter 17. Maybe do some googling for a few Phil Schneider video seminars. Read and/or watch David Adair's testimonies. Yeah...the government doesn't have any advanced (alien/demonic?) technology they're hiding from us, or anything. Because Walter Cronkite would've told us about it, right? If you go to the website from whence these photos came, you'll find a second photographer who has caught images of a flying, aerosol-spewing disc. Where's Katie Couric when you need her? "I saw this chemtrail forming to the west of Vail, Colorado on March 7, 2008 at 5:23PM. 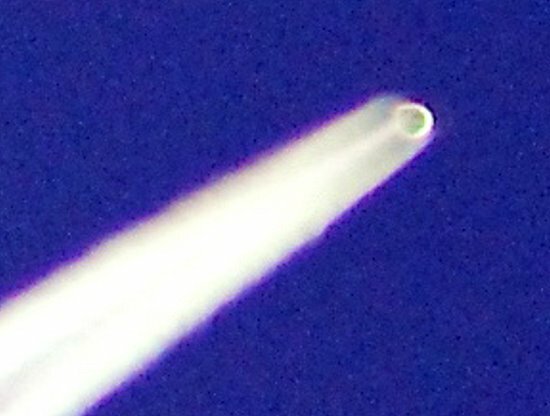 As I zoomed in full with a 70 to 300 lens on my D200 Nikon, there appeared to be no plane in front of the chemtrail - like it was forming out of thin air. After shooting several shots, there was another plane-less chemtrail rising to the west just before sunset. It was spooky. When I downloaded the pictures, there was a halo shape at the front of the chemtrail in some of the images and absolutely nothing visible in others." "I've watched jets leaving no contrail at all fly towards a cloud and turn on the chemtrail upon entering the cloud and exit the cloud leaving none. 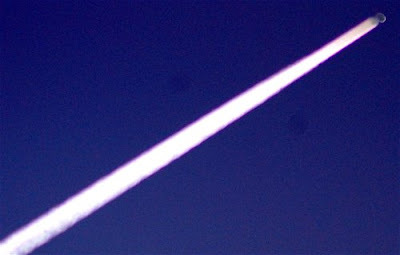 I've photographed jets at similar altitude leaving no visible exhaust trails flying near jets leaving huge chemtrails. The next day after saturation missions, I've seen a return to normal jet traffic and normal vanishing contrails. The denial from people that say this is all normal don't remember what is was like in the west before the late 90s." I know exactly the feeling. I spent most of my teen years growing up (during the 70's) in the West and Southwest...in Tucson, AZ and Roswell, NM. I spent a huge amount of time outdoors playing golf during those years. I saw any number of contrails. But I saw nothing of these bizarre, conspicuous jet trails having all these odd features. THE USE OF "SMART DUST" FOR IMAGE PROJECTION, PERHAPS? If we're to believe any of the Project Bluebeam information...the Antichrist cabal has great interest in mind-blowing 'image projection'. Huge holographic images spread across the skies by which to create a kind of "shock and awe" propaganda onslaught. LINK: Scientists unveil moving 3D holograms. I think we might want to allow for the possibility this 'magic dust' has an image projection capability. I'm just trying to keep in mind Jesus' warning and the warning of the Book of Revelation, regarding mindboggling "signs and wonders" being performed by these people. Will they be able to make images of the beast (the Antichrist) appear at will? And cause these images to appear to come to life? And possibly even convey deadly force (electromagnetic or micro waves?) through this 'smart dust'? Because of the nano-sized particles it might be possible to create a very high resolution image that could barely be differentiated from a real, physical object (or person). One thing is for sure--these people ARE going to display staggeringly impressive signs and wonders, such that they could almost deceive the very elect "if it were possible".